1929 built CC&F (lot # 791)/CPR Shops, E.O.# 2497, heavyweight steel, length = 75 ft 6 in. 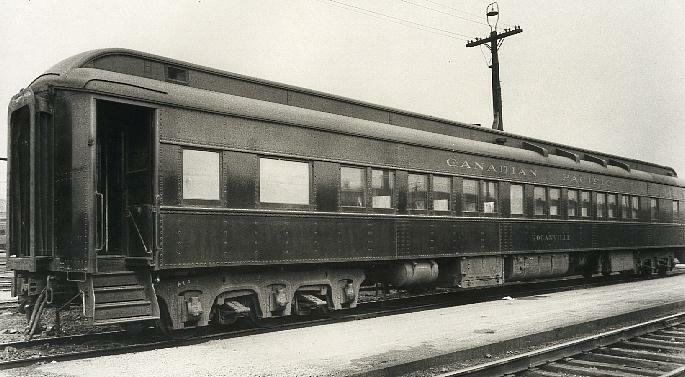 29 cars were built in this series, including RAPID CITY, RATHWELL, RAVENSCRAG, RAYMOND, RED DEER, REDCLIFF, REDVERS, REGENT, REGINA, RENNIE, RENOWN, RESTON, REVELSTOKE (1954 renamed RIPPLES), RIVERTON, ROBLINDALE, ROCANVILLE, ROMFORD, ROSEMARY, ROSEMERE, ROSENFELD, ROSETOWN, ROSSLAND, ROSSPORT, RUBY CREEK, RUSKIN and RUTHERGLEN. 1952/53 # 11610 added to name. 1973 acquired "OWL & ENGINEER RESTAURANT" Scott Rd., Surrey, B.C. (restaurant name has changed several times). Car side cutaway but interior still intact, with sleeping rooms used for small parties. 1952/53 # 11618 added to name. 1988 acquired ACQ WEST COAST RAILWAY ASSOC. PHOTO: Dave Shaw, Winnipeg, Man. 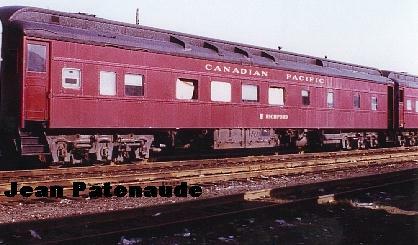 October 12, 1963 shows a modernized "R" class sleeper. Modernization included moving the Drawingroom's annex mid car allowing the placement of 2 picture windows for the occupant's viewing pleasure. 1952/53 # 11624 added to name. 1980's (early), car stored New Westminster, B.C. 1952/53 # 11614 added to name.